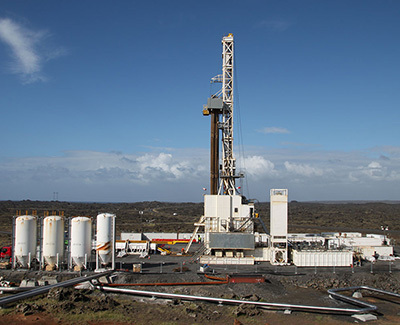 That is the task of a rig now drilling 5 kilometres into the rugged landscape of old lava flows in Reykjanes, at the south-west corner of Iceland. Drilling began on 12 August. By the end of the year, the Iceland Deep Drilling Project (IDDP) hopes to have created the hottest hole in the world, hitting temperatures anywhere between 400 and 1000 °C. At that depth, pressures are more than 200 times atmospheric levels. The consortium of energy companies and researchers behind the project expects the water to be in the form of “supercritical steam”, which is neither liquid nor gas and holds much more heat energy than either. A well that can successfully tap into such steam could have an energy capacity of 50 megawatts, compared to the 5 of a typical geothermal well, says Albertsson. This would mean some 50,000 homes could be powered, versus 5,000 from a single well. Nintendo has unveiled its new console, the Nintendo Switch, which will be released in March 2017. The console is a hybrid machine, half portable and half traditional console. The device, which takes games loaded on cartridges, can be used as a traditional console like a PS4 or Xbox One, with the machine docked with the TV and a wireless controller, called the Nintendo Switch Pro Controller, used to play games on it. But it can also be used in a number of portable modes. The main body, which has a screen, can be undocked from the hub and carried away. Owners can then either attach controllers (called “Joy-Cons”) to its side, and use it like a portable games console – think a massive PS Vita – or prop up the screen and use the wireless controllers instead. A second type of wireless controller allows owners to dock the two mini controllers to either side of a wireless body, and play using that. The Joy-Cons are included; the Pro Controller is an optional accessory. 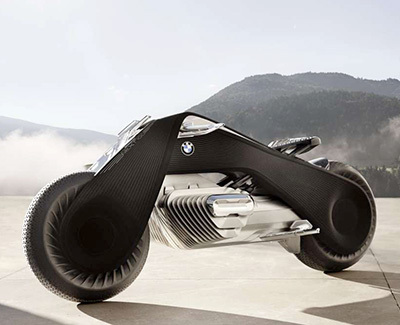 The BMW Motorrad Vision Next 100 motorcycle is the latest incarnation of BMW's Vision Next series, which celebrates 100 years of the German brand with forward-looking concept vehicles from Rolls-Royce, Mini, and BMW. It's a bike that has self-balancing systems to keep it upright both when standing and in motion. Several systems — one BMW calls a "Digital Companion," which offers riding advice and adjustment ideas to optimise the experience, and one called "The Visor," which is a pair of glasses that span the entire field of vision and are controlled by eye movements — correlate to return active feedback about road conditions to the rider while adjusting the ride of the bike continuously depending on the rider's driving style. It also uses a "flexframe" that's nubile enough to allow the bike to turn without the joints found on today's motorcycles. The idea is that when a rider turns the handlebar, it adjusts the entire frame to change the direction of the bike; at low speeds only a slight input is required, while at high speeds it needs strong input to change course. Trusted Reviews has published a 10/10 review of Sony's recently released virtual reality goggles. "Priced at £349.99, it’s significantly cheaper than the Oculus Rift (£549) and HTC Vive (£759)." 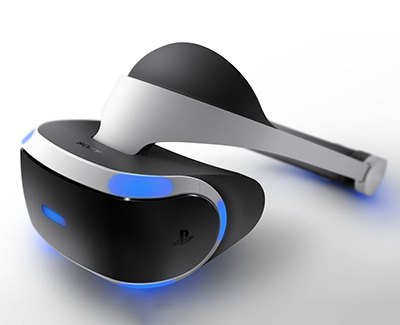 "PlayStation VR is simply the best virtual reality headset you can buy right now. It’s cheap while not compromising on performance and quality. The headset is simply stunning and incredibly comfortable to wear, and the games already available are some of the best VR experiences I’ve ever played." "Compared to the Oculus Rift it offers a far more comfortable gaming experience at a much lower price point. Against the Vive it may not offer the level of detail and immersion, but is close and doesn’t require the installation of additional sensors in your home and will not demand as much space for many games, either." "I was so excited about virtual reality, but this was replaced with frustration the longer I tried to use the Oculus Rift. Now? I couldn’t be more enthused, and it’s all thanks to PSVR." THE ELBO CHAIR is unusual piece of furniture.Arthur Harsuvanakit and Brittany Presten of Autodesk’s generative design lab created the chair, but they didn’t design it. Harsuvanakit and Presten collaborated with Dreamcatcher, Autodesk’s generative design CAD system. 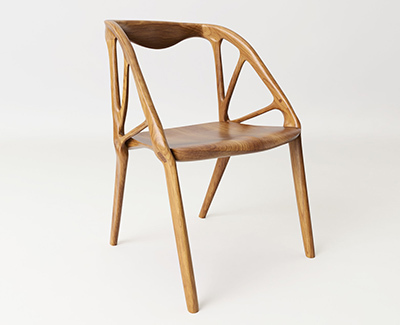 They fed the software a digital, 3-D model of a chair inspired by Hans Wegner’s iconic Round Chair and the Lambda Chair, from the design studio Berkeley Mills. Then, they stipulated how much weight the chair must support and insisted that the arms clear a human body. With that, Dreamcatcher started iterating. The software churned out hundreds of designs, optimising as it went. It shaved dead weight and adjusted joint placement to improve load-bearing abilities, creating thinner, more intricate structures. “It gets bonier as the iterations go higher,” Harsuvanakit says. “It’s cool to let it go too far — some of them look like bug skeletons to me.” Every so often, he and Presten would pick a design, and the software would propagate a new lineage based on their selection. Harsuvanakit calls the Elbo a collaboration between human and machine. Dreamcatcher might spin out solutions a designer might not think of, but at a certain point the human mind overrides the algorithm. The look and feel of the final object did not originate in the designer’s mind, but it requires his sign-off. The Elbo is CNC-milled from wood. This posed new challenges. Dreamcatcher’s materials library doesn’t include wood so Harsuvanakit and Presten designated 'nylon', which Harsuvanakit says is the most suitable ringer for walnut wood. The final design performs well. The Elbo has 18 percent less material than the hybrid model the designers started with, and shows fewer signs of stress in its joints. In Greek mythology, Sisyphus was condemned to roll a boulder up a mountain for all eternity*. In my art, Sisyphus is a kinetic sculpture that rolls a ball through sand, forever creating and erasing beautiful patterns. I have been creating Sisyphus sculptures for nearly 20 years, and have large, 3-meter diameter permanent installations in Switzerland, Germany and Australia. Over time I have come to view Sisyphus as more than a kinetic art piece: it is an instrument. As a musical instrument plays songs, Sisyphus plays paths. My goal with this Kickstarter is to get Sisyphus into people's homes for them to enjoy as both furniture and art, but also, to inspire a community of composers to write ’music‘ for it. Remaining pledge prices for 2 foot diameter tables start at $795. *In Greek mythology Sisyphus was the king of Ephyra (Corinth). He was punished for his self-aggrandising deceitfulness by being condemned to roll an immense boulder up a hill, watch it come back to hit him, and then repeating the procedure again for eternity [ed]. 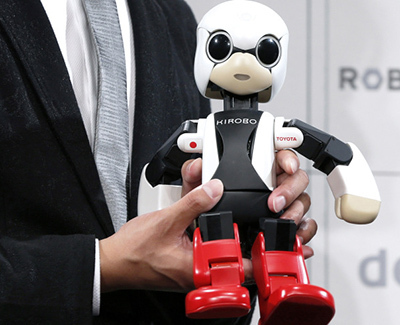 Toyota has unveiled a doe-eyed palm-sized robot, dubbed Kirobo Mini, designed as a synthetic baby companion in Japan. Toyota’s venture aims to tap a demographic trend that has put Japan at the forefront of ageing among the world’s industrial nations. Toyota plans to sell Kirobo Mini, which blinks its eyes and speaks with a baby-like high-pitched voice, for 39,800 yen (£300) in Japan next year. It comes with a cradle that doubles as its baby seat designed to fit in car cup holders.